Ukraine's president says the pro-Russian separatist is part of a Kremlin puppet show. A pro-Russian separatist wants to replace Ukraine with a new nation. Alexander Zakharchenko is the leader of a self-proclaimed state within Ukraine. He's proposing an entirely new nation — what he would call "Malorossiya," or "Little Russia." The name "Malorossiya" is used to refer to large parts of what is now Ukraine. But that was before Ukraine declared its independence from Russia. Nowadays, most Ukrainians find the term offensive. 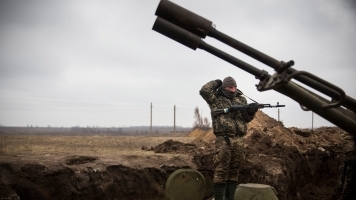 The statement could throw a wrench into the already fragile peace talks between Kiev and the rebels. The United Nations estimates the conflict has killed more than 10,000 since 2014. It doesn't seem like Zakharchenko has much support, though, even from his own side. A neighboring self-proclaimed separatist state wasn't aware of the Little Russia idea and said it didn't support it. Ukraine's current president called the rebel leader a Kremlin puppet, pointing to previous "Novorossiya," or "New Russia," initiatives by the separatists. Ukraine, Russia and the separatists have all agreed to send representatives to meet in Minsk on Wednesday.